Ski boots are a a crucial part of the armoury you need to get around any ski resort in good order. 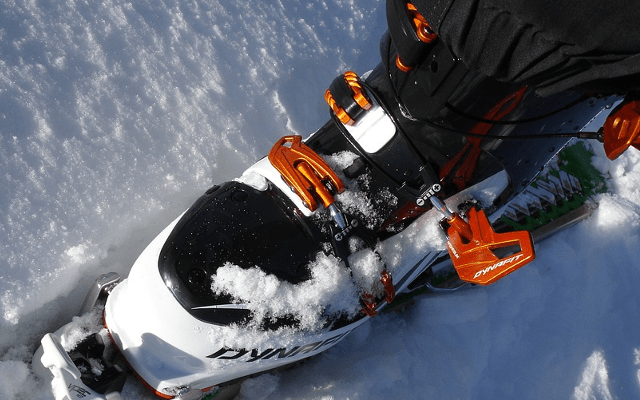 In order to reach your potential as a skier, the optimal connection between your skis and boots is a key element. An optimal connection will ensure you’re able to put on you performance on the slope and will boost your confidence and comfort. The bottom line is that you must have a well-chosen, appropriate and comfortable boot if you are going to enjoy your sport. 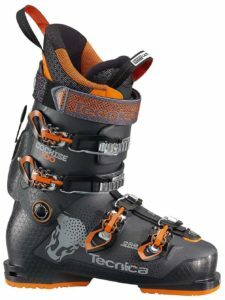 We explore the best ski boots for 2019 to assist you in making the right decision. Check underneath the full reviews to see our comparison table. 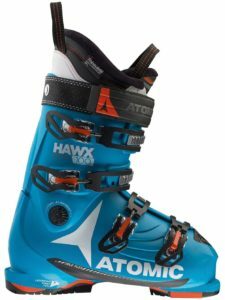 These boots are for advanced skiers who are looking for top notch performance from their ski boots. Stiff and aggressive enough to respond to small inputs, the boot has been designed in a way that looks to meet the demanding needs of versatile skiers. Its performance from the all mountain capabilities to downhill performance is enhanced by swappable soles, including some that are ideal for hiking. Heavier skiers have the 130 flex option for their use which also comes with a low volume width of 97 mm. Their customized design matches the shape of your feet and is a great feature that has become a hallmark of this brand. The quick instep design enables ease of entry. Made from pliable polyester this ensures a precise, comfortable fit. The boot’s shell is equipped with 4 aluminum micro adjustable buckles and a 45 mm power strap. This gives you a stiff feel once you have buckled it. These boots are offered in either low volume of 98mm or medium width of 100mm. The safety features of this boot are unique when compared to other models. The fit you get is about 90 percent and it is comfortable for most skiers. This boot ranked amongst the most customisable that we’ve reviewed this year. This boot can be manipulated in different directions marketing has dubbed this feature the “custom 360 degree boot”. It has a downhill focus and its smooth forward flex and support. Advanced downhillers will enjoy the upgraded flex models of 120 and 130 while more intermediate skiers will likely prefer the 80 and the 100 flex models. This is an ideal boot for most resort skiers. Versatility comes from combining the middle of the road width options of 100 mm and 102 mm. Heavier skiers may prefer the 130 flex model which is moderately stiff with powerful turns. It is a relatively new boot in the market having been released in the last couple of years and the comfort level has been enhanced with a quality liner and buckles. 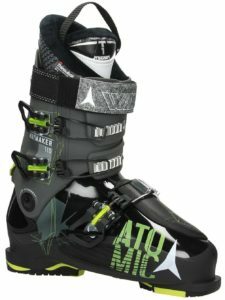 It is a unique line of boots having evolved independently from the racing boots and comes with modern features ideal for mountain skiing. Women’s version: Dalbello Kyra 95 I.D. A strong product for mountain skiing having been made with a three piece slick shell. The super stiff lower portion is good for superior power transfer. The upgraded liners are much more comfortable, resistant and light enough for packing. They are designed exactly to your fit so you don’t need to adjust them after you have bought. There is also an extra breathing space due to its four contour technology. These boots are both customizable and comfortable. They also offers you great value as they come at a very affordable cost. The 99mm model in particular is ideal for those looking for a smoother operation. You can choose the stiffer flex models of 100 and 120 for bombing downhill if that’s more to your tastes. 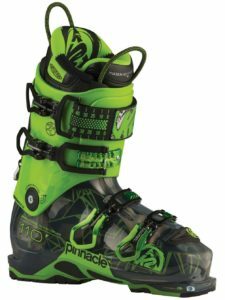 These boots are generally fun, light and versatile to be used by any intermediate skier. Up there with the best for medium width feet. The high volume fit and adjustable forward lean ensures serious performance during skiing as you can tailor it to your specific angle preferences. Replaceable soles and four strong buckle design make them a good choice if you’re likely to be needing hiking capabilities from your boot. It’s also a very comfortable boot even for hard chargers. 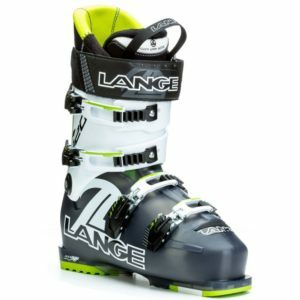 This boot manages to incorporate a number of advanced features in a very affordable way and is a good choice for those aspiring to advance their skiing skills without breaking the bank. It has a tight heel pocket to help those who struggle to retain their heels and the build is heavily biased towards the use of stretchable materials. 35 degrees of movement make it a great boot for resort skiing. 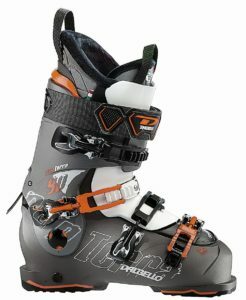 A very popular boot among skiers because of its reliable reputation. 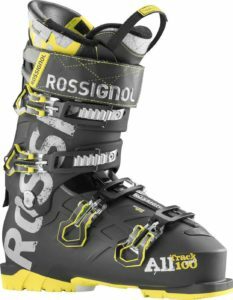 This boot is a good option for intermediate skiers who are looking to branch out into mountainous regions. It has a decent, if not luxurious, walk mode function which can be improved further for greater flex and uphill. 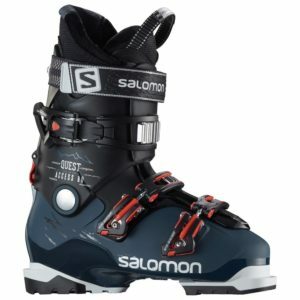 Undoubtedly a solid boot for lighter skiers and those on short tours. You can also get more flex options for 110 an 130. This is an ideal boot for beginners and one of the most respected within the skiing industry. Features include a hike switch at the back, a lower and upper cuff unlock for normal walking and schlepping gear. It comes with a simple to operate 3 buckle design and a heat mold-able liner. It can be customized before you embark on your hiking or touring mission. 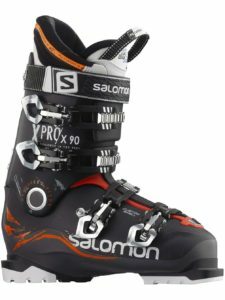 It also has the widest last among all Salomon products and as such should be able to serve you well until you get to the intermediate levels. 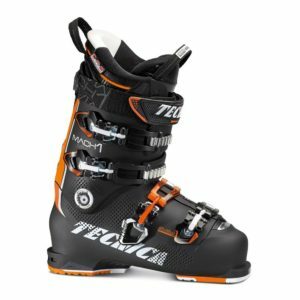 In choosing the best ski boots for 2019 you have to look at the various aspects such as flex and last. The size may also be something to consider as the size of the boot may influence your skiing abilities. The more advanced you grow the tighter the boot should be. As you begin you may go for a larger boot to maximize your comfort but as your skills grow you have to balance comfort and performance. The width of the boot will also be a significant consideration in your choice. While by no means a universal truth, we did find that men also tend to go for stiffer boots when compared to women – worth keeping in mind if you’re purchasing boots as a present!